Buy the Farm . . . Share: Excelsior! A strange role reversal has taken place. Generally I am content eating the same meal again and again for lunch and dinner for multiple days. It is Jen that has little to no tolerance for repeating meals. She can have something for dinner then leftovers for lunch but never in the same day and never back-to-back dinners. 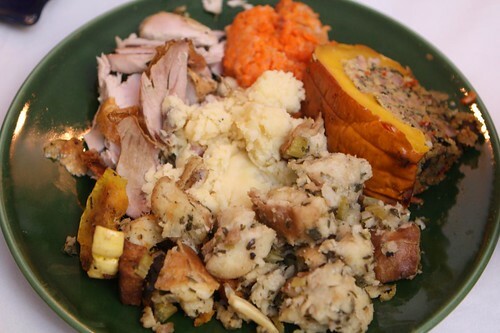 However, with our bounty of leftovers, Jen is somehow still going strong with wanting to have leftover Canadian Thanksgiving tonight for the fifth consecutive meal! I, on the other hand, am looking to begin branching out with something a little different. 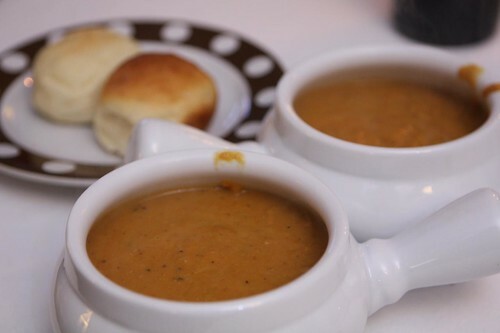 I started by making this root vegetable bisque with the leftover roasted root vegetables. I browned up a little crushed garlic, added the shallots, rutabaga, carrot, sweet potato, butternut squash, acorn squash, and turnips. After adding some vegetable stock and a little cream I pureed the mixture. I served it up with some of Jen's delicious rolls. Unfortunately there were only two left which was wholy inadequate. After the soup I made a large leftover plate for us to share. 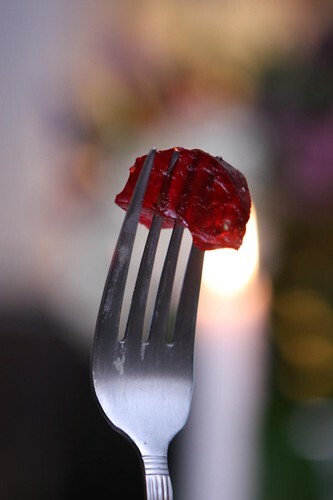 After moving through all of Jen's chunky cranberry sauce we moved on to her cranberry jelly. Jen is no longer satisfied with making only one type of cranberry sauce. She asked beforehand if she should make just one type of cranberry sauce this year and I said that was probably a good idea. After a pause she said, "Yeah, I'm going to make two anyway." 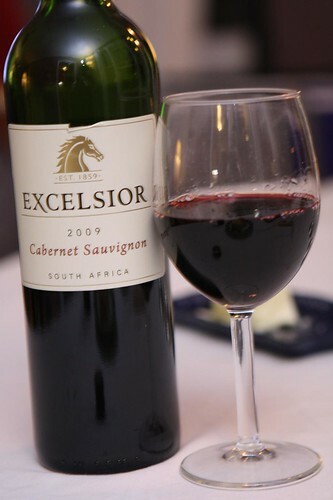 To accompany the turkey dinner Jen had this Cabernet Sauvignon from Excelsior in South Africa. This was good and bad. The good was that it was a tasty Cabernet. The bad was the Jen had to deal with me occasionally interrupting dinner to yell "Excelsior!" While periodically exclaiming the name of Jen's wine I enjoyed this Dubbel I got while at Allagash in Portland last week. This beer should be readily available as I've had their White and Tripel on multiple occasions each. For some reason I've never run into the Dubbel so I figured I'd pick some up and give it a go. The Dubbel was pretty good. It was a little more bitter than the Tripel but still very tasty. I recommend it as a nice accompaniment to Thanksgiving leftovers. Jen tried to combat my cries of "Excelsior!" 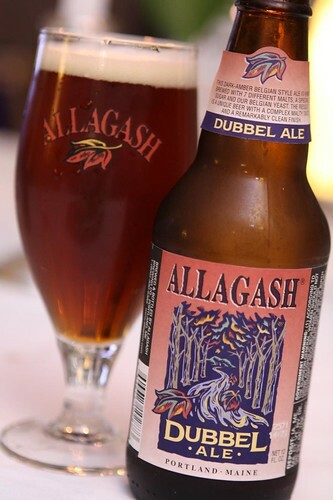 with cries of "Allagash!" but gave up after a few tries. It's just not as much fun as yelling "Excelsior!" Over lunch this afternoon I made a shopping list for next year's Canadian Thanksgiving. 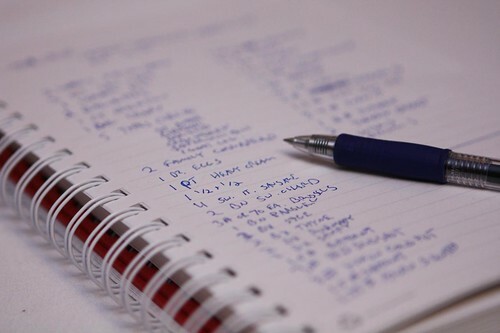 I'm hoping that next year, as opposed to this year, I actually consult these notes. 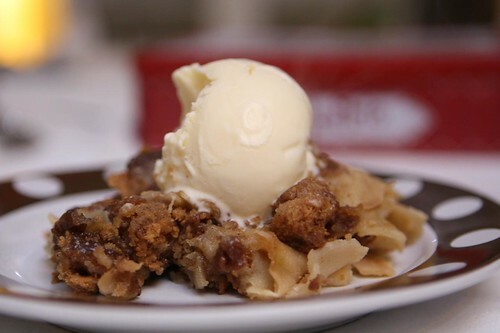 For dessert I heated up some of the leftover apple pie, mashed it up, and served it hot with some vanilla ice cream. Coincidentally this is Professor X's favorite dessert!